When buying a new hard disk drive or HD DVD, Blu-ray, DVD or CD drive for your computer it’s crucial that you choose the most appropriate Serial ATA (SATA) data cable to connect your drive to the motherboard securely allowing for a direct path without bending the cable too much. I’m going to describe the most common kinds of SATA cables you can purchase and which ones are appropriate for different situations. Often abbreviated SATA or S-ATA, an evolution of the Parallel ATA physical storage interface. SATA is a serial link — a single cable with a minimum of four wires creates a point-to-point connection between devices. Transfer rates for Serial ATA begin at 150MBps. One of the main design advantages of SATA is that the thinner serial cables facilitate more efficient airflow inside a form factor and also allow for smaller chassis designs. SATA supports all ATA and ATAPI devices. When compared to the older type IDE drive cable which were quite wide and limited to a length of 40cm, SATA cables are much thinner and can be upto 1m in length (internal) or 2m in length (external eSATA cables only). In addition there are 2 speed levels for SATA devices: SATA= upto 1.5Gb/s and SATA II= upto 3Gb/s. In reality as with all speed specifications, the real life speed will be much less but a SATA II device will allow greater throughput if the rest of the computer system can keep up with it. The term SATA II has grown in popularity as the moniker for the SATA 3Gb/s data transfer rate, causing great confusion with customers because, quite simply, it’s a misnomer. The first step toward a better understanding of SATA is to know that SATA II is not the brand name for SATA’s 3Gb/s data transfer rate, but the name of the organization formed to author the SATA specifications. The group has since changed names, to the Serial ATA International Organization, or SATA-IO. The 3Gb/s capability is just one of many defined by the former SATA II committee, but because it is among the most prominent features, 3Gb/s has become synonymous with SATA II. Hence, the source of the confusion. This cable is the most commonly sold and has the same straight connectors at both ends so it’s most often the cheapest as well. There are no problems with using this cable as long as the cables path between the drive and the motherboard is reasonably stright or just curved. However it is inappropriate if the cable has to be really bent around an obstruction within the case. This is a variation on the Straight Both Ends cable and will only connect to newer motherboards that support latched SATA cables. It has the benefit of a more secure connection, but the downside that if it’s used in a cramped area, it can be hard to get your fingers in to unlatch the cable. 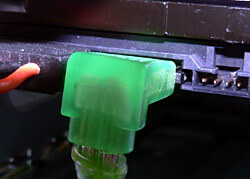 One of the complaints users had about SATA when it first launched, was the connectors. Yes, the new cable design was great for airflow and plugging the connectors in was a doddle. However, they did feel a little insecure, fragile, and left you wondering whether you’d plugged them in properly. 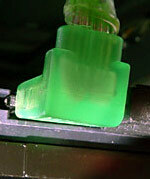 With a new generation of SATA products surfacing, a solution to this has been devised. 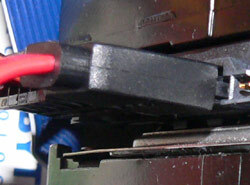 New SATA sockets and connectors feature a latching system. Plug in the cable and a metallic latch clicks into place, securing the cable. To remove the cable, you press the latch against the connector and pull it out. When plugged into a drive the cable connector points downwards (as seen in the photo at right). This makes it unsuitable for use in drives which are near the floor of a computer case because the cable would have to be bent upwards to be plugged into the motherboard at the other end. However it’s perfect for drives mounted high up in a case. When plugged into a drive the cable connector points upwards (as seen in the photo at right). This makes it perfect for use in drives that are near the floor of a computer case but not good for use with drives mounted high up in a case. The odds are that if you buy a device which supports eSATA connection, (such as a external hard disk drive enclosure) than it will be supplied with all the necessary cables. External SATA (eSATA) applications range from a single disk external drive to multi-disk external storage/backup with RAID/Port multiplier features. New generation Set top box (STB) and motherboard (MB) product releases have also added eSATA connectors. The market demand for eSATA external storage is on the rise. I just bought an internal DVD burner but it has (I think) a SATA connection that I was not expecting. I have a lead from my power supply that fits it and now it has power, but it is not recognised as an extra drive. There is still another place for a lead and I assume that is for data, but does that mean it will plug into my motherboard somewhere, or do I need an adaptor back to the IDE connection. My motherboard is MS-6787-VER:2. If it connects to the motherboard, what lead do I need? I have a motherboard (P5GL-MX Asus) having a serial type HDD. I’m wondering if installing another HDD, which is SATA, can my motherboard still support both different type of HDD? Can a cable limit the speed of a device? I purchased a SATA II 300 HDD, and required another cable, which in it’s description, said to be SATA ATA 150 Data Cable! 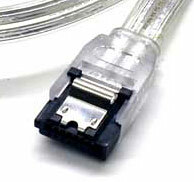 The Wikipedia definition states that SATA ATA cables do not limit connectivity. If this is so, then why are the cables listed along with their SATA datarate? Also, is there any other problems when using a 4-pin Molex – to SATA power adapter other than possible loss of hot swapping? I think my cheap SATA cable is causing data transfer problems… as when I changed cables the problem seemed to go away (I’m still checking). How do I determine which cable is high quality and which cable is poor quality. I suspect price… but a quick search found only cheap SATA cables not pricier ones. as i was plugging my I notice acrid smell of smoke coming from it, and now i have no power at all. i think i burnt the circuit board or some other problem? is it possible to connect the WD hard disk to my desktop if i buy this USB to SATA adapter thats been mentioned on the internet? what kind of cables (any SATA cable) or parts do i need to connect it to my desktop to recover all my data? Desktops normally still all have a PATA connector on the motherboard. Just attach a cable and you ought to be able to recover it. Alternatively a PATA/SATA adaptor will allow you to use a SATA port. I have done it both ways. The SATA adaptor requires power… so you have to connect the little floppy power cable to the adaptor… making it mildly more fiddly. I can now confirm that since I changed SATA cables I still haven’t had any further problems. my experience and testing with sata 3 cables is they do not need to be specifically sata 3 cables, however it is important to buy good quality cables and not scrimp on a few dollars. Our shops service hundreds of computers every week. By far the biggest cause of problems these days is caused by SATA cables failing to connect properly. This impacts the operating system causing all sorts of complaints which at first sight don’t appear related. It is the first thing all of our engineers look at when a PC is brought in. I am appalled at how disk manufacturers have moved from the reliable (but cumbersome) pin headers used on IDE drives to these incredibly flimsy and unreliable connectors. There isn’t a “better quality” connector – there’s only crap and REALLY crap. As a small chain of service shops, we can’t find a source of reliable cables. We have sourced hundreds, but at the end of the day it is the mechanics of the connector that are at fault.